Way back in 2012 I wrote a fairly basic piece on Power Mac security, and ever since then I've promised repeatedly to do an update for what's happened in between. So here it is. The usual advice well-meaning but annoying people will give us Power Mac users is, "there are many security holes in your machine, so you shouldn't ever use it on the Internet." The first part is true. The second part is, at least right now, not. You just have to understand where the vulnerabilities lie, patch the holes you can, and mitigate the vulnerabilities that you can't. However, doing so is absolutely imperative and absolutely your responsibility. If some easily remotely exploitable bug surfaces that cannot be mitigated or blocked, I'll change my tune here, but that's not presently the case. The most important thing to keep in mind is that, as virtually all the regular readers of this blog know, Power Macs use a completely different architecture than the majority of what's out there today, and this has important security ramifications. The vast majority of presently extant low-level exploits like buffer overflows and use-after-frees broadly depend on being able to deposit Intel or ARM machine code in memory and have it executed by the victim application, but our instruction set and (often) memory layout are completely different, so any such exploit would have to be specific to PowerPC to successfully execute. At worst, an non-PowerPC exploit of this type would just crash the application or, in extreme cases, the machine. While the more security conscious amongst you will (correctly) point out this is a special example of "security by obscurity," that doesn't mean this heterogeneity isn't an advantage. Attackers go where the money is, and it's not our machines. No current Intel Mac can easily generate code that will run on a Power Mac without a lot of work either. So as promised, here's an updated practical guide to keeping your beloved Power Mac safe, or at least safer, today 11 years and nine operating system releases after the last Power Mac rolled off the assembly line. This post is hardly comprehensive and you should not assume it covers all relevant deficiencies, but, for the record, these are the recommendations I myself use on my own systems. I reference prior blog posts here you can read for more details, but this guide will cover the basic notions and try to give you an idea of priority. Please note: this document primarily applies to systems running 10.4 and later. The classic Mac OS through OS 9.2.2 has an extremely small attack surface because of its radically different architecture, and while browsers on OS 9 (including, though this is improving, Classilla) are subject to information leakage attacks and should not run Flash or Java, other kinds of attacks are almost impossible upon it. There are a few exceptions noted below. For 10.0 through 10.3, however, there are sadly much fewer good options for securing these systems, and I would simply advise putting them behind a good firewall and assuming everything you do on them is not secured. Obviously, I also assume for the below that you're running the current version of TenFourFox and can securely download additional tools if necessary! Make sure your clock is set correctly: certificate verification will fail if your clock is off more than a few minutes in either direction. Particularly on 10.4 systems (but also observed on 10.5), systems with long durations of uptime without sleeping or being shutdown may go out of synchronization with any time server you use. The first and easiest way to reestablish the connection to your timeserver is either by rebooting, or unchecking and then re-checking the time server checkbox in System Preferences. If your system is powered on and off regularly you may not have a need even to do this much. However, if this is insufficient and you are comfortable with the command line, you could try the more definitive solution in our article. Consider using a non-admin account for basic activities: this will ensure that, if a old PowerPC-compatible exploit or Trojan horse is around and does get through, the damage is limited. At least one well-known OS X Trojan horse circulated in a PowerPC-compatible version as late as 2012! Why do I have to enter my password? Consider this every time you're asked for it; a little paranoia is just good common sense. Ask yourself, does this application actually need administrative access? Or is this program doing something other than it claims? Built-in networking: On OS X, enable the built-in firewall in System Preferences (Sharing, Firewall) and enable stealth mode, and if you can, also Block UDP Traffic from the Advanced menu within that preference pane. This substantially reduces the surface for incoming network threats. Using a hardware firewall is even better, especially in combination, as well as disabling UPnP on your router if your applications don't require it; in fact, my personal daily drivers live on a specially secured wired network that cannot directly route to the Internet. There are a number of possible exploits in the network-accessible components of 10.4 and 10.5 and simply preventing access to them in this fashion is probably the best approach. Note that UDP is still necessary for some kinds of protocols such as local Windows file and printer sharing (in that case, blocking it at the router level rather on individual Macs would be more appropriate), and disabling UPnP may be problematic for some applications. WiFi: All Power Macs are subject to the KRACK attack and there is no known client-side fix (more info). The problem can be mitigated by going into your router settings and selecting WPA2 (not just WPA!) AES-CCMP as your only means of Wi-Fi security, which some routers may abbreviate to just "AES." Do not use TKIP. Routers may also be vulnerable, particularly if your router is itself a client to another WiFi network such as being in repeater mode; you should check to see if a firmware update is available, and consider another router if necessary. Although AES-CCMP is much more resistant to attacks than TKIP and an attacker cannot actually join a network secured with it, they could clone your access point to a second access point with the same SSID and MAC/BSSID on a different channel and entice you to transparently connect to that. This is not very likely in a controlled home environment, but it could be an issue for public Wi-Fi or close quarters like dorms or apartments. Immediately disable Wi-Fi if you see two copies of the same network; it could be an attempt to snare you. See our article for a more in-depth way of detecting such an attack. If you are on a public Wi-Fi connection you can't control, you should assume your connection is completely insecure (the same applies for WEP, such as on Mac OS 9, which does not support WPA2 natively, or WPA). Use a VPN if you have it available, and/or only connect to secure hosts, such as over HTTPS and SSH, to layer your connection with a secondary level of encryption. A better browser can help ... like, I dunno, TenFourFox. Just a suggestion. Bluetooth: All Power Macs are potentially vulnerable to BlueBorne-based attacks, though the practical likelihood of being exploited is low (more info). These attacks are generally low-level and would need to be specific to PowerPC to function, but could be a source of system instability if a malicious Bluetooth device is broadcasting poison packets with Intel or ARM code embedded in them. Keep Bluetooth off if you don't need it except in controlled environments; when tethering, if a malicious device is likely to be in range, Wi-Fi is probably safer even with the caveats above. These are well-known vulnerabilities in OS X which can be, in some cases, exploited remotely. Press the ESCape key and then type :wq! (colon, lower case "w", lower case "q", exclamation point) and press ENTER. If you get an error, you did it wrong; start over. See the original article for more information. RootPipe/systemsetupusthebomb: This is an actual flaw in another privileged system component called writeconfig that can be exploited to write arbitrary files with root permissions, also giving an attacker administrative access. The simplest fix is to go to System Preferences, and under Security, check "Require password to unlock each secure system preference" (and make sure the lock at the lower left is locked). Now any known use of the vulnerable tool will either fail or at least prompt you for a password. This covers all known exploits for this component, but for a more comprehensive approach (that may have side effects), see the original article. Put the file in your home directory and double-click to decompress it. You should be left with a file named bash-4.3.30-10.4u. Do not change the name. Close all terminal windows and programs if they are open, just to make sure you won't stomp on bash while a program is trying to call it. Start /Applications/Utilities/Terminal and have exactly one window open. In that Terminal window, type these commands exactly as shown. If you get any errors, STOP and ask for help. Restart your Mac as a paranoia to make sure everything is using the new copy of bash. If you're not sure, bash --version will display what you're running (mine says GNU bash, version 4.3.30(5)-release (powerpc-apple-darwin8.11.0). The version we provide is universal and will work on PowerPC and Intel from 10.4 through at least 10.9. If you want to check if your version is correctly behaving, see the original article for a test battery. Although there aren't updates for most of these, you should at least be aware of the actual risk, and how to reduce it. Some of the entries in this and the following sections reference plugins. These are usually stored in /Library/Internet Plug-Ins, but there may be per-user plugins installed in Library/Internet Plug-Ins in your home folder. You can disable them as recommended below by simply moving them to another folder, or deleting them outright if appropriate. Java: Java is not safe on Power Macs; all versions of Java provided on any PowerPC-compatible version of Mac OS or OS X have serious well-known vulnerabilities. In particular, exploits such as Flashback can obtain system access in a cross-platform fashion. If the Java plugin is on your computer, it should be removed or disabled (or use TenFourFox, natch, which won't even run it), and you should only run signed Java applets from trusted sources if you must run them at all. QuickTime: There are historical PowerPC-based exploits for certain codecs in QuickTime, though none of these are known to be circulating now, and no specific PowerPC-based exploit is known for QT 7+ generally. (While QT 6.0.3 in OS 9/Classic is technically vulnerable, the limitations of OS 9 make the exploit difficult and it would have to be specific to both OS 9 and PowerPC.) It is possible for QuickTime playlists and certain other kinds of scriptable content to be used to load data over the network, but they can be only interacted with in limited ways, and to actually use them for executable data would require a PowerPC-compatible attack. While such an attack is feasible and possible, it isn't very likely to occur or succeed on a Power Mac. This mode of attack can be minimized further by removing or disabling the QuickTime Plugin (or use TenFourFox, natch, which won't even run it); removing the Plugin won't affect using the QuickTime Player. I'm sure all of you are enthusiastic daily drivers of TenFourFox, but WebKit should also be updated because of how many other apps depend on it. For 10.5, of course, the best solution is Tobias' Leopard WebKit. Leopard WebKit not only includes a very current WebKit framework, but also includes an updated OS Security framework, and can relink WebKit shells and other programs using a provided utility. Unfortunately, a similar supported option is not available for 10.4. TenFourKit, also written by Tobias, does update the system framework somewhat but does not include security or encryption updates, and has not received any updates since 2012; it's basically the same version as the framework built-in to the OmniWeb browser. For this reason, you should avoid Safari and other WebKit shell applications like iCab on 10.4, as they will not be sufficiently protected, and you should be cautious of apps that attempt to display web pages over the network since the vast majority will use the built-in WebKit also. Because the OS's security framework is also not current, many secure sites will either not connect properly, or throw inexplicable errors. Currently all WebKit shells support, and will instantiate, plugins (TenFourFox doesn't). I still advise disabling them or removing them where appropriate, but if you can't do this, ClickToPlugin will at least reduce drive-by risk in Safari. Mail.app: Mail uses the built-in system WebKit (as above), and may have other deficiencies which are not patched. These deficiencies likely require PowerPC-specific exploits, though Apple Mail's general lack of updates implies other vulnerabilities likely lurk such as information leaks and inadequate connection security. Although Tenfourbird (an unaffiliated project) was once a solid and secure alternative, it has not been maintained since version 38.9 as of this writing, so unfortunately I am no longer able to generally recommend it. The simplest and safest approach is simply to use a webmail service instead in TenFourFox or Leopard WebKit unless you absolutely must have a local mail client; in that case, I would use Tenfourbird over Apple Mail, since it is at least more up to date. Your web browser: Currently TenFourFox (10.4+), Leopard WebKit (10.5 only) and Roccat (10.5 only) are known to be updated on a semi-regular basis (we issue TenFourFox releases with security updates, updated certificates and pinned keys every six weeks simultaneously with Firefox ESR updates). No other browser is current, though at least a re-linked WebKit shell will have fewer vulnerabilities. Note that Roccat also needs to be relinked with Leopard WebKit for maximum security. Flash: Flash is not safe on Power Macs; all PowerPC-compatible versions of Adobe Flash Player have serious well-known vulnerabilities. The cross-platform Rosetta Flash exploit is able to steal credentials and cookies with 10.1 and earlier versions of Flash, and the recommended server mitigation does not fix the problem in these versions (only Flash 10.2+). Furthermore, Flash applets have been previously demonstrated to attack network settings in a cross-platform fashion, and there are other sandbox escape vulnerabilities that have been reported. Although unofficial "later" versions of the Flash plugin have circulated for Power Macs, these are still Flash 10.1 internally with a bumped version number and do not actually have any fixes. Unless you have content that absolutely cannot be viewed without Flash, you should remove or disable the Flash plugin (or use TenFourFox, natch, which won't even run it); a tool like SandboxSafari or the experimental PopOut Player can help reduce the risk for legacy content that still requires it. Microsoft Office and OpenOffice/NeoOffice/LibreOffice: None of these office applications is currently updated for Power Macs and all of them have potential vulnerabilities to Word and Excel macro viruses, though the OpenOffice derivatives are much less likely to be successfully exploited. For Word it is unlikely you will want macros enabled (and you should definitely turn them off in the preferences except for those rare situations in which they are needed), but this could be a real issue for Excel power users. Office v.X, and Office 98 in Classic/Mac OS 9, are probably too old to be effectively pwned, but many macro attacks against Office 2004 and 2008 will run on Power Macs and the Open XML Converter can be attacked in some of the same ways. Microsoft, damn their Redmond hides, does not offer any of the updaters prior to Office 2008 for download anymore, but I've archived some of them on the Gopher server. For Office 2008, start here (note that you may need to download earlier service packs, which are currently still available as of this writing). Note that Office 2008 cannot run Visual Basic for Applications (VBA), which is a drop in functionality but also a reduction in attack surface, nor can the OpenOffice alternatives. NeoOffice has not been updated for PowerPC in some time; 5.2.0alpha0 is the last version of LibreOffice for Power Macs and is generally my recommendation, but you can also download OpenOffice 4.0.0. All will run on 10.4+. Note that while iWork/Numbers does support some Excel macros, it does not support VBA and seems to have some issues interpreting macros in general, so it is less likely to be exploited. The venerable AppleWorks nee ClarisWorks is also not known to have any serious vulnerabilities. Microsoft Virtual PC (and other PC emulators): I won't belabour this point except to say this depends greatly on what you run inside the emulator. Remember that a virtual machine installation of Windows can be just as hosed as a real installation, and can be an even greater malware risk if it has network access. Some Linuces will still run in VPC (I used to use Knoppix). Otherwise, stick to Windows and patch patch patch, and/or completely disable networking or enable bridged mode, which uses your Mac as a firewall for the emulated PC, as appropriate. Watch this blog as other security-related posts appear. Yes, your Power Mac has holes, but until such time as they can't be plugged or the system is no longer fit for your purpose, nothing says the only choices are a forced upgrade or sit unprotected. So far we've made our systems last over a decade. I think we can still safely keep them viable a while longer. TenFourFox Feature Parity Release 4 final is now available (downloads, hashes, release notes). It will become live on Monday "evening" as usual. There is no debug version for final since the only reason I was doing that for the last FPR or two was to smoke out issue 72, for which the fix now appears to be sticking (but, as usual, there will be one for FPR5b1). For FPR5 the big goals are expanded AltiVec (enable strchr() everywhere else, finish as much as possible of the AltiVec VP9 intra predictors), some DOM and Web compatibility improvements, and some additional performance improvements primarily in the session store module and the refresh driver. More on those soon. And now for something completely different: is the 1GHz Sonnet G4 card worth it? First of all, ObTenFourFox announcements: we are on track for TenFourFox Feature Parity Release 4 launching with Firefox 57/52.5 (but still supporting classic extensions, because we actually like our users) on November 14. All new features and updates have stuck, so the only new changes will be the remaining security patches and certificate/pin updates. In the meantime, I have finally started work on adding AltiVec-accelerated VP9 intra frame prediction to our in-tree fork of libvpx, the WebM decoder library. This is the last major portion of the VP9 codec that was lacking AltiVec SIMD acceleration, which I'm doing as a more or less direct port of the Intel SSE2 version with some converted MMX and SSE routines; we don't use the loop filter and have not since VP9 was first officially supported in TenFourFox. Already there are some obvious performance improvements but the partial implementation that I've checked in so far won't be enabled in FPR4 since I haven't tested it thoroughly on G4 systems yet. The last little bit will be rewriting the convolution and averaging code sections that are still in unaccelerated generic C and a couple little odds and ends. Watch for the first draft to appear in FPR5. Also, in the plain-layouts-are-beautiful dept., I encountered a fun search engine for the way the Web used to be. Floodgap is listed, of course. More about that philosophy at a later date. On to the main event. One of the computers in my stable of systems is my beloved Power Macintosh 7300, a classic Old World beige PCI Power Mac. This 7300 served as my primary personal computer -- at that time with a 500MHz Sonnet G3, 192MB of RAM and a Rage Orion 3D card -- for about three and a half years and later became the first gopher.floodgap.com before I resurrected it as a gaming system. 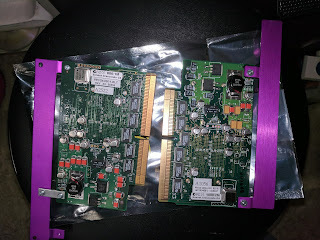 Currently it has 1GB of RAM, the max for this unit; the same Rage Orion (RAGE 128 GL) 3-D accelerator, which I prefer to PCI Radeons for those games that have 3-D support but weren't patched for various changes in the early Radeon cards; two 7200rpm SCSI drives; a 24x CDROM; a (rather finicky) Orange Micro OrangePC 620 "PC on a card" with 128MB of RAM and a 400MHz AMD K6-II CPU; and, most relevantly to this article, a Sonnet Crescendo/PCI 800MHz G4 CPU upgrade card, running a PowerPC G4 7455 CPU with 256K L2 cache at CPU speed and 1MB of L3 at 200MHz. The system boots Mac OS 9.1 and uses CPU Director to disable speculative access and, for those hardware situations that require it, L2 and L3 caches. Overall, this system runs pretty well. It naturally can chug through Classilla pretty well, but it also has the Mac ports of a large number of games from a smattering of 68K titles to software-rendered titles like Doom, System Shock, Full Throttle, Wing Commander III and up through 3-D titles near the end of OS 9's life such as Shogo MAD and Quake III and its derivatives like Star Trek Voyager: Elite Force. 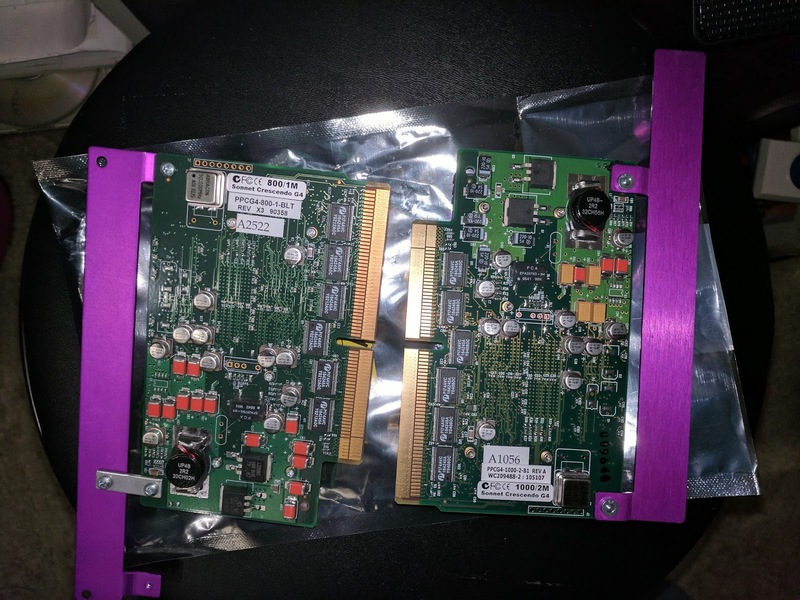 The PC card boots both Windows 95 OSR2 and Windows 98 to run games like Outlaws and Dark Forces II: Jedi Knight that were never ported to PowerPC Mac OS or OS X. The Crescendo/PCI cards struggle against the relatively weak system bus speed of these Macs which tops out at 50MHz. I've heard apocryphally of hacks to exceed this, but the details are unknown to me and all of them also allegedly have compatibility problems ranging from moderate to serious, so I won't discuss them here. To counter that, the 1GHz card not only increases its L3 cache speed from 200MHz to 250MHz (using the same 4:1 multiplier as the 800MHz card it's based on), but doubles its size to a beefy 2MB (the L2 cache remains 256K, at full CPU speed). The system must slow to the bus speed for video and other peripherals, but CPU-bound tasks will hit the slower RAM much less. None of this is unusual for this type of upgrade, and anyone in the market for a card like this is already well aware it won't be as fast as a dedicated system. The real question for someone like me who has an investment in such a system is, is it worth finding such a beast to know you've pushed your beloved classic beige Mac to its absolute limit, or is the 800MHz card the extent of practicality? First, let's look at the card itself. I've photographed it front and back compared with the 800MHz card. 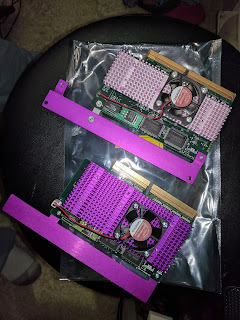 With the exception of some minor board revisions, the two cards are nearly identical except for the stickers and the larger heat sink. More about that in a moment. The card doesn't bench 3.33x the speed of the baseline G3/300 used by MacBench, but it does get almost 2.5x the speed. It runs about 25% faster than the G4/800, which makes sense given the clock speed differential and the fact that the MacBench code probably entirely fits within the caches of both upgrade cards. Besides the louder fan, the other thing I noticed right away was that CPU-bound tasks like Virtual PC definitely improve. It is noticeably, if not dramatically, smoother than the 800MHz card, and the responsiveness is obviously better. With this promising start, I fired up Quake III. It didn't feel a great deal faster but I didn't find this surprising, since beyond a certain threshold games of this level are generally limited by the 3D card rather than the CPU. I was about to start checking framerates when, about a minute into the game, the 7300 abruptly froze. I rebooted and tried again. This time it got around 45 seconds in before locking up. I tried Elite Force. Same thing. RAVE Quake and GLQuake could run for awhile, but in general the higher-end 3-D accelerated games just ground the system to a halt. Perhaps I had a defective card? Speculative I/O accesses were already disabled, so I turned off the L2 and the L3 just to see if there was some bad SRAM in there, though I would have thought the stress test with MacBench and Virtual PC would have found any glitches. Indeed, other than making OS 9 treacle in January, it failed to make any difference, implying the card itself was probably not defective. My wife was put back into monitor stand service and the 800MHz card was replaced. Everything functioned as it did before. So what happened? In this system there are two major limitations, both of which probably contributed: heat, and power draw. Notice that larger heat sink, which would definitely imply the 1GHz card draws more watts and therefore generates more heat within a small, largely passively cooled case in which there are also two 7200rpm hard disks, a passively cooled 3D accelerator and an actively cooled PC card. Yes, all those little fans inside the unit certainly do get a bit loud when the system is cranked up. The other problem is making all those things work within a 150W power envelope, the maximum the stock Power Mac 7300 power supply can put out. Let's add this all up. For the two 7200rpm SCSI drives we have somewhere between 20 and 25W draw each, so say 50W for the two of them if they're chugging away. Each PCI card can pull up to a maximum of 25W per spec; while the PC card was not running during these tests, it was probably not drawing nothing, and the Rage Orion was probably pulling close to its limits, so say 30-35W. The CD-ROM probably pulls around 5W when idle. If we assume a generous, low-power draw of about 2W per RAM stick, that's eight 128MB sticks to equal our gigabyte and 15-20W total. Finally, the CPU card is harder to compute, but Freescale's specs on the 1GHz 7455 estimate around 15 to 22W for the CPU alone, not including the very busy 2MB SRAM in the L3; add another 5 or so for that. That's up to 137W of power draw plus any other motherboard resources in play, and we're charitably assuming the PSU can continuously put out at max to maintain that. If there's any power sag, that could be enough to glitch the CPU. Running this close to the edge, the 3-6W power differential between the 800MHz and 1GHz cards is no longer a rounding error. Now, if heat and/or power were the rate limiting characteristics, I could certainly yank the PC card or get rid of one of the hard drives, but that's really the trick, isn't it? The entire market for these kinds of processor upgrades consists of people like me who have a substantial investment in their old hardware, and that investment often consists of other kinds of power hungry upgrades. Compared to the 800MHz G4, the 1GHz card clearly pushes the envelope just enough extra to kick a system probably already at its limits over the edge. It's possible Sonnet had some inkling of this, and if so, that could be one reason why they never had a 1GHz G4 card in regular production for the beige Power Macs. The 1GHz card is still a noticeable improvement particularly in CPU-bound tasks; the 2MB of L3 cache in particular helps to reduce the need to hit slower RAM on the system bus. For gaming, however, these cards have never been the optimal choice even though they can get many titles within reach of previously unsupported configurations; on PCI Power Macs, the 3D accelerator has to be accessed over the bus as well, and it's usually the 3D accelerator that limits overall framerate in higher-end titles. In addition, none of these CPU cards are particularly power-thrifty and it's pretty clear this uses more juice than any other such card. Overall, if you can get your hands on one and you have a beefier PSU like an 8500 (225W) or a 9600 (390W), this would be a great upgrade if you can find one at a nice price and certainly the biggest grunt you can get out of that class of system. If you have a smaller 150W system like my 7300 or the other Outrigger Power Macs, however, I'd look at your power budget first and see if this is just going to be a doorstop. Right now, unfortunately, mine is now just a spare in a box because of all the other upgrades. And that's a damn shame.